The scene… an idyllic little suburban home, as father and son sit on a couch in front of the TV, watching Gordon Ramsey call Italian restaurateurs idiots. Off in one corner, the wife and mother of the home sits at her workspace, computer fired up and running. She flicks back and forth between websites and active programs with the ease of long use. Cassie: I think I’ve done everything in Goldshire. Do I go to Westfall next? BBB: Yes, Westfall is the next zone for humans. You already have the flight path from our Deadmines run. Or, you could take the tram up to Ironforge, do some questing in the dwarves’ 1-10 starter zone. Cassie: It looks like I still have some quests in western Goldshire I haven’t done. BBB: Ah, yes, there are some quests out there to do. Just make sure you tell me before you take on Hogger… It usually takes a party of 2 or 3 to take him on. Cassie: Ack! I’m gonna die! I’m gonna die! BBB: Use Evasion and Sprint to safety. Cassie: I don’t know where Evade is! BBB: …. Are you still alive? Cassie: Yes. There were four of them! They jumped me! BBB: Yep, them gnolls are tricky buggers. Cassie: Hey! I’m gonna die! Darn it, that’s not fair! No! BBB: How many jumped you this time? 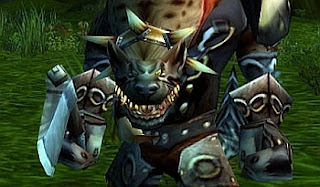 BBB: Welcome to WoW… that would be Hogger, your first introduction to being ganked. He patrols there near the river. Did you wander into him? Cassie: No, I pulled him with my thrown knives. BBB: ….. Perhaps I should have mentioned this before, but bad guys with golden dragons wrapped around their portraits are elite… and hit about 3x harder than normal, with 3x more armor and health. He is a nasty bugger that hogger fellow. There is an equally but less famous mob in Silverpine Forest that gank unsuspecting horde.. Son of Argual.